If there is one man who could be credited with placing karate in the position it enjoys on the Japanese mainland today, it is Gichin Funakoshi. This Meijin (Master) was born in Shuri, Okinawa, and didn't even begin his second life as harbinger of official recognition for karate on mainland Japan until he was fifty-three years old. Funakoshi's story is very similar to that of many great in Karate. He began as weak, sick, and in poor health, his parents brought him to Yasutsune Itosu for his Karate training together with Yasutsune Azato (Azato is considered by many the reason Funakoshi developed such a disciplined mind and Karate Technique). Between his doctor, Tokashiki, who prescribed herbal remedies that would strengthen him, coupled with Azato's and Itosu's good instruction, Funakoshi soon blossomed. He became a good student with Arakaki and Sokon "Bushi" Matsumura as his other teachers, he developed expertise and a highly disciplined mind. Master Funakoshi recounts this part in a different way, while living with his grandparents he started attending primary school where he was classmate of Azato's son and received his first Karate instruction from Yasutsune (Ankoh) Azato. When he finally came to Japan, from Okinawa, in 1922, he stayed among his own people at the prefectural students' dormitory at Suidobata, Tokyo. He lived in a small room beside the entrance and would clean the dormitory during the day when the students were in their classes and work errands as a gardener too. At night, he would teach them karate. After a short time, he had earned sufficient means to open his first school in Meishojuku. Following this, his Shotokan in Mejiro was opened and he finally had a place from which he sent forth a variety of students, such as Takagi and Nakayama of Nippon Karate Kyokai, Yoshida of Takudai, Obata of Keio, Shigeru Egami from Waseda (his successor), Hironishi from Chuo, Noguchi of Waseda, and Hironori Ohtsuka (Otsuka). It is known that in his travels in and around Japan, while giving demonstrations and lectures, Funakoshi always had Takeshi Shimoda, Yoshitaka (his son), Egami and Ohtsuka accompanying him. His main instructors in the thirties and forties were T. Shimoda and Y. Funakoshi. Shimoda was apparently an expert from the Nen-ryu Kendo School, he also studied Ninjutsu, but he unluckily fell sick and died very young in 1934, after one of the exhibition tours. He was replaced by Gigo (Yoshitaka) Funakoshi, a man of excellent character, highly qualified technically. Shigeru Egami's opinion is that there was nobody better qualified for taking over the teaching. Due to his youth and vigorous training methods (sometimes classified as brutally-strong training) immediate hierarchical conflicts arose with the older Ohtsuka Hironori. Some actually say he was not able to take the hard training. What is clear is that he left the school to establish his own style, Wado-ryu (the Harmonious Way). It's quite obvious that the name alludes to the conflict with Yoshitaka. Yoshitaka's influence was very important for the future of Karate-do but once again death came very soon for Yoshitaka, dying at age 39 of a lifelong affliction (tuberculosis) in 1945. The martial arts world in Japan, especially from the early Twenties and up to the early Forties, was an ultra-nationalist moment in history, and they looked down their noses at any art that was not pure, calling it a pagan and savage art. Needless to say, many karate clubs flourished on mainland Japan. In 1924, karate was introduced in Keio University as the first Karate Club others include: Chuo, Waseda (1930), Hosei, Tokyo University (1929) among others. Another club was established in Shichi-Tokudo, a barracks situated in a corner of the palace grounds. Funakoshi visited the Shichi-Tokudo every other day to teach. One day, when Ohtsuka was teaching at the Shichi-Tokudo, a student, Kogura, from Keio University who had a san-dan degree (3rd-degree black belt) in kendo (Japanese fencing) and also a black belt in karate, took a sword and faced Ohtsuka. All the other students watched to see what would happen. They felt that no one could face the shinken (open blade) held by a kendo expert. Ohtsuka calmly watched Kogura and the moment he made a move with his sword, Ohtsuka swept him off his feet. As this was unrehearsed, it attested to his skill. It also bore out Funakoshi's philosophy that kata practice was more than sufficient in times of need, and just as importantly to Master Funakoshi's great ability as a teacher and Karate technician. In 1927, three men, Miki, Bo and Hirayama decided that kata practice was not enough and tried to introduce Jiyu kumite (free-fighting). They devised protective clothing and used kendo masks in their matches in order to utilize full contact. Funakoshi heard about these bouts and, when he could not discourage such attempts, which he considered belittling to the art of karate, he stopped visiting the Shichi-Tokudo. Neither Funakoshi nor Ohtsuka showed up ever again. It was after this event that Gichin Funakoshi prohibited sports sparring (the first competitions did not appear until after his death in 1958). When Funakoshi came to mainland Japan, he taught 16 kata: 5 pinan, 3 naihanchi, kushanku dai, kushanku sho, seisan, patsai, wanshu, chinto, jutte and jion. He kept his students on the basic ones before they progressed to the more advanced forms. Actually at least 40 kata were included in the curriculum, these were later included in the limited edition but monumental work by Shigeru Egami "Karate-do for the Specialist". The repetitious training that Master Funakoshi instituted paid back very well; his students went on to produce the most precise, exact type of karate taught anywhere. Jigoro Kano, the founder of modern judo, once invited Funakoshi and a friend, Makoto Gima, to perform at the Kodokan (then located at Tomisaka). Approximately a hundred people watched the performance. 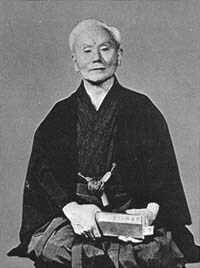 Gima, who had studied under Yabu Kentsu as a youth in Okinawa, performed the Naihanchi shodan, and Funakoshi performed the koshokun (kushanku dai). Kano sensei watched the performance and asked Funakoshi about the techniques involved. He was greatly impressed. He invited Funakoshi and Gima to a tendon (fish and rice) dinner, during which he sang and made jokes to put Funakoshi at ease. Irrespective of his sincerity in teaching the art of true karate, Funakoshi was not without his detractors. His critics scorned his insistence on the kata and decried what they called "soft" karate that wasted too much time. Funakoshi insisted on hito-kata sanen (three years on one kata). Funakoshi was a humble man. He preached and practiced an essential humility. He did not preach the humility of virtue, but a basic humility of a man who is rooted in the true perspective of things, full of life and awareness. He lived at peace with himself and with his fellow men. Whenever the name of Gichin Funakoshi is mentioned, it brings to mind the parable of "A Man of Tao (Do) and a Little Man". As it is told, a student once asked, "What is the difference between a man of Tao and a little man?" The sensei replies, "It is simple. When the little man receives his first dan (degree or rank), he can hardly wait to run home and shout at the top of his voice to tell everyone that he has obtained his first dan. Upon receiving his second dan, he will climb to the rooftops and shout to the people. Upon receiving his third dan, he will jump in his automobile and parade through town blowing the horn, telling one and all about his third dan". The sensei continues, "When the man of Tao receives his first dan, he will bow his head in gratitude. Upon receiving his second dan, he will bow his head and his shoulders. Upon receiving his third dan, he will bow at the waist and quietly walk alongside the wall so that people will not see him or notice him". Funakoshi was a man of Tao. He placed no emphasis whatsoever on competitions, record breaking or championships. He placed emphasis on individual self-perfection. He believed in the common decency and respect that one human being owes another. He was the master of masters. He died in 1957 at age 89, after humbly making the largest contribution to the art of Karate-Do. NOTE: Funakoshi sincerely believed it would take a lifetime to master a handful of kata and that sixteen would be enough. He chose the kata which were best suited for physical stress and self-defense, stubbornly clinging to his belief that karate was an art rather than a sport. To him, kata was karate.